Time for a weekend break or a last-minute getaway and you don't want to have to find and declutter your suitcases? Then you should consider getting a dedicated travel duffel bag! Not only are these bags easier to handle but they are also lighter in weight, more stylish, and offer a range of essential functionalities. With such a wide array of travel duffel bags available, we've compiled this list of our top five favorite duffel bags in a bid to narrow down your choices. By the end of this article, you should have a much clearer understanding of what is currently available on the market as well as what features best fit your needs. We'll wrap up this article with a conclusion that will include our recommendation for the best travel duffel bag of 2018. 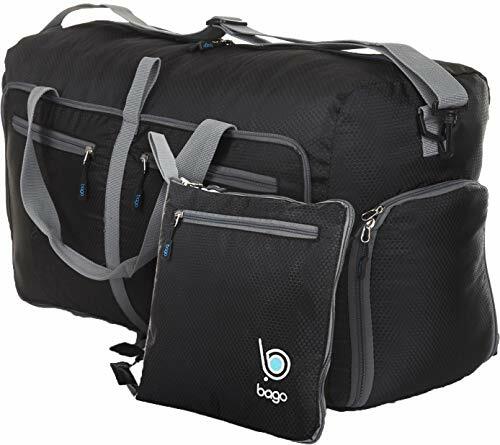 The Bago Travel Duffle Bag is an affordable and lightweight bag that offers buyers a fantastic level of convenience and reliability, which are the reasons why it made it into our top five list. This bag is extremely versatile and great for those who are never sure of how much extra space they may need on a trip. This duffle bag is made out of ultra-thin and lightweight nylon that uses a honeycomb weave pattern for increased tear resistance. This material naturally lends itself as a strong water repeller, making it extremely weather-resistant as well. Despite its light weight of only 1.5 pounds, when fully expanded, this bag delivers a relatively large amount of space and measures in at 27 by 11 by 15 inches, which equates to 85 liters. The Plambag Oversized Duffel Bag delivers buyers with a much more casual and stylish finish, all thanks to its canvas exterior. This design allows the bag to be used across a variety of purposes whether it be travel, casual, or even business use. This bag utilizes a unique compartment feature as the two end pockets can be quickly and easily detached or reattached within moments. These pockets are connected through a zipper system. As a result, this bag is able to adapt to a variety of situations and leaves the user not having to carry more bags than they need. Opting for a high-density fabric exterior, this bag is heavier than its nylon counterparts. However, it is a lot more pleasant to handle and certainly feels like you get more for your money. The bag also uses an interior nylon lining for increased durability and waterproofing. Measuring in at 24.4 by 9.8 by 11.8 inches, this bag offers users a 50-liter volume, which is ample space for gym visits or quick trips away. This area is spread across four compartments including the main compartment, the two removable side compartments, and also a conveniently located front compartment. The unique design and quality construction of the Hexad Duffel Bag are what landed it a spot on our top five list. This bag contains a tonne of extra features that are rarely found on more entry-level duffel bags but are reflected in its price. This bag not only operates as a duffel bag but it can also be quickly transformed into a backpack by attaching its removable back straps. This allows users to transport the bag with much greater comfort across long distances or more challenging terrain. Users will also benefit from the bag’s clamshell opening, which allows them to access all of their luggage quickly and with ease. The Hexad is constructed using a 1680 ballistic nylon with weather-resistant army coating. This makes it not only extremely durable and long lasting but also waterproof. Due to the density of this material, it is relatively heavier than other duffel bags, but it also provides that feel of expert-quality production. The Hexad isn't short of extra features too. Users will be able to take advantage of its padded laptop sleeve, fleece-lined cell phone pocket, spill-proof pockets, and even an RFID secure passport pocket. These little added extras can really make a difference in the overall level of comfort and ease of your trip. 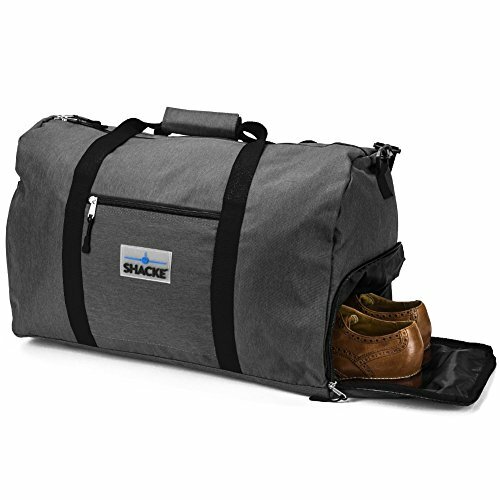 The Shacke’s Express Weekender Duffel Bag offers all of the functionality you'd hope to see from a quality travel duffel bag. What’s more is that it does so at a fantastically affordable price, which is why it made it into our top five. With five compartments in total, this bag allows users to separate important pieces of luggage. Users will benefit from an elasticated side pouch, which is fantastic to keep travel documents in as its quickly and easily accessible. It also has an internal shoe pouch, a front zipper compartment, and an inside hanging compartment, which is great for valuables. These are all alongside the main compartment itself. This bag is constructed with durable, water-resistant dragon nylon, which is created through a unique weaving process. This, in turn, extends the product’s life expectancy. This bag also uses YKK zippers, which are considered the best in the world for their smooth zipping. 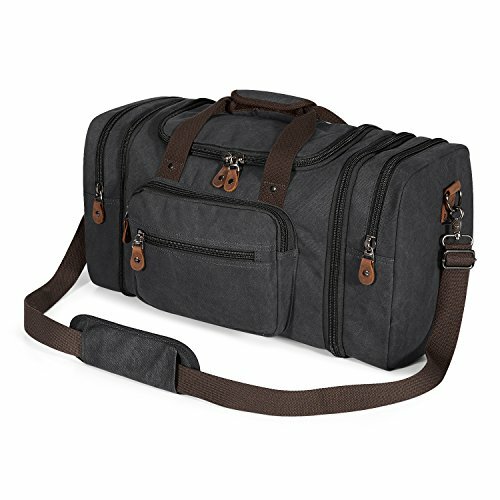 Measuring in at 19.5 by 9 by 13.5 inches, this travel duffel bag offers a good amount of room for those quick trips away. It is also extremely lightweight for a bag of its size and construction, weighing less than two pounds. Another foldaway travel duffel, the Gonex Travel Bag made it onto our list for its incredible capacity alongside its packable nature. This bag also comes in a large variety of colors, making it great for those looking for something to suit their style. With expanded dimensions of 31.89 by 16.93 by 11.81 inches, this duffel bag is able to offer an incredible 100-liter capacity, making it one of the largest practical travel duffel bags available. 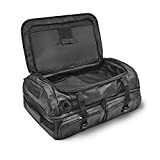 It is a great luggage replacement or additional luggage bag that can be easily stored or packed away inside another bag until it's needed. Despite its larger size, this bag only weighs 1.74 pounds, leaving it around 80% lighter than your average empty suitcase. This bag is highly durable too, thanks to its honeycombed 210D nylon fabric construction. This also makes it highly water-resistant. Users will also benefit from its leak-resistant metal zippers. Gonex offers fantastic customer service and prides themselves on the quality of their products. This is why they provide a 100% money-back guarantee if you're not satisfied with your product within the first 30 days. This bag also comes with a one-year manufacturer’s warranty and lifetime customer service support. 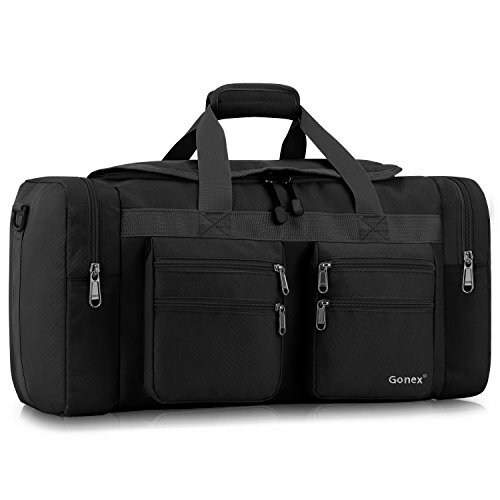 In conclusion, our best travel duffel bag of 2018 is the Gonex Travel Duffel Bag. Not only does this bag offer a far superior storage capacity when compared to other bags in its class, but it also does so while offering the increased functionality of being a duffel bag that can be folded down and stored within another bag. The convenience that this duffel bag offers is fantastic and can also be found in the Bago Travel Duffel Bag. This is the reason why it is also a great choice for those looking for something similar but perhaps a little smaller. Then again, the level of customer support offered alongside the Gonex Duffel Bag also makes it a great choice. Not only does the Gonex offer this fantastic level of functionality but it also comes at an incredibly budget-friendly price, making it difficult to find a cheaper bag offering anywhere near the same features. For those who are, perhaps, looking for a few more extra accessories, you might want to consider the WANDRD Hexad. While it does offer interesting features, it is far more expensive than anything else in our list.